The Washington Press was by far the most popular iron hand press in America, a position it held from the 1820s until the end of the hand press era. The press was invented during the 1820s by Samuel Rust, a New York printer nearly unknown today. Rust’s patent of 1821 (now lost) probably covered the toggle mechanism, a figure-4 arrangement which provided greater leverage than the simple elbow toggle of the Wells and the Smith. Rust’s second patent of 1829 covered a new frame, one that had hollow cast-iron columns enclosing wrought-iron rods, the true tension members. These hollow columns made the press much lighter and easier to transport, a major factor in its success in America. 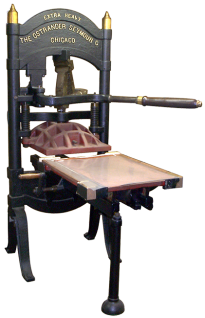 The earliest Washington presses, which had acorn frames, were manufactured by Rust and his partner Turney. Later, presses with the patent vertical frames were made by Rust alone. Around 1834, Rust’s rival, the R. Hoe & Company, succeeded by a ruse in getting Rust to sell out to John Colby, a Hoe employee. Colby passed the business–with patent rights–back to the Hoe Company, which thereafter manufactured the press alongside its own Smith press, building the toggles of the latter into the upright frame of the Washington. At the expiration of the patents, other American companies began producing their own versions of the Washington. Ostrander-Seymour, a Chicago company in business from 1896 until at least the late 60s, manufactured equipment for printers, such as cameras, photo-engraving equipment, as well as the press pictured. The words “Extra Heavy” are cast into the frame of the press. It is still in use at the Still Standing Press Company of Vancouver, BC, Canada.